Columba. © 2003 Torsten Bronger. Columba (abbreviation: Col), the Dove (as released by Noah), is a small southern constellation, the main part of which is a noticeable triangle of stars set into a fairly blank area of sky. 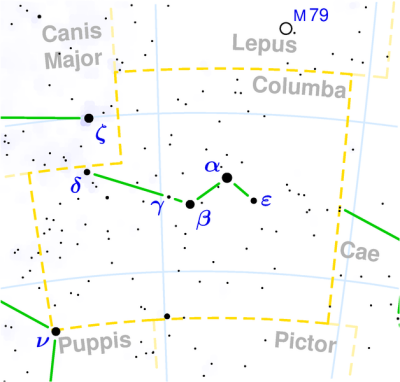 Mu Columbae is a blue star (type O9.5, magnitude 5.16) that is one of three runaway stars diverging from a point in Orion with a speed of about 100 kilometers per second. The other two are AE Aurigae and 53 Arietis. According to one theory, these stars once belonged to a quadruple system, of which the fourth member exploded in a supernova, about 3 million years ago, pushing the other three stars away in different directions. 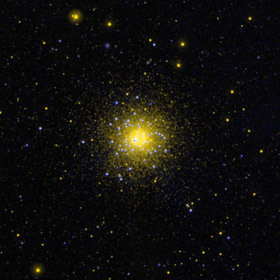 Columba also contains the globular cluster NGC 1851 (magnitude 7.1; diameter 11'; distance 40,000 light-years; R.A. 05h 14.1m , Dec. -40° 2.8'). See below for details of the constellation's brightest stars. NGC 1851 in ultraviolet. Credit: NASA/Galex.